With a string of over 10 full-inventory, franchised and operated hotels and over 1,100 rooms across the UAE, OYO Hotels is ready to offer the benefits of its full-stack technology led hospitality model to hoteliers across the country. The company raised Dh3.68 billion ($1 billion) funding through SoftBank Investment Advisers last month. OYO chain of hotels is currently present in over 350 cities with over 12,000 asset partners spread across six countries including India, China, Malaysia, Nepal, the UK and now UAE in the Middle East. 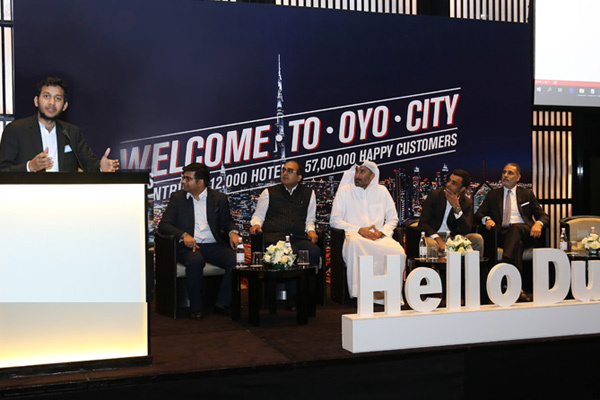 OYO plans to host guests in over 12,000 rooms within 150 hotels across the UAE by 2020. According to data from Dubai Corporation of Tourism & Commerce Marketing (Dubai Tourism), overall, Dubai hotel room supply is set to reach 132,000 by the end of 2019. Dubai Tourism also forecasts the hospitality sector to experience sharp, sustained growth over the coming years, with occupied room nights set to reach 35.5 million annually in 2019, representing a 10.2 percent compound annual growth rate over the next 24 months. The United Arab Emirates is working on a target of opening over 75,070 rooms, across the country and other neighbouring countries, and preparing to welcome over 25 million visitors at World Expo 2020. OYO will be working towards transforming the hospitality industry in the region, by partnering in this vision.